When Suzie Yorke was in her mid-40s, she hit a wall after years of adhering to a low-fat diet. Yorke had spent years suffering from IBS, and in 2016 her illness reached critical levels. That was the year Yorke read Big Fat Surprise by Nina Teicholz and made the shift to a high-fat, low-carb diet. She felt better right away, but struggled to find healthy-fat snacks to accommodate her new lifestyle. Seeing a gap in the marketplace, Yorke developed a company that produces high-fat, low-carb and low-sugar products called Love Good Fats. According to Yorke, “fat is back” and she means that in the best possible way. 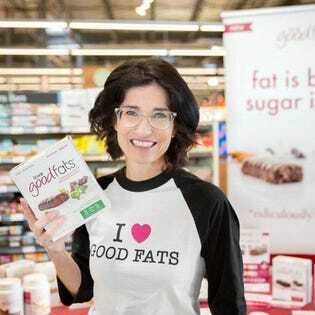 Love Good Fats has quickly become one of the fastest-growing bar brands in North America. I talked to Yorke about how she decided to make Love Good Fats’ products keto-friendly, what her first year as an entrepreneur was like and how she transitioned the business from its Canadian roots to the United States. Deborah Sweeney: You were always committed to health and wellness, so what did your career path look like before you became an entrepreneur? Suzie Yorke: I have always had an entrepreneurial spirit! I started off in the Electrical Engineering field, having completed my bachelor’s degree at McGill University in Montreal. From there I transitioned my career to the marketing field and spent the next 30 years in the CPG industry, working for several high-profile companies like Proctor & Gamble, PepsiCo, Kraft Heinz, Weight Watchers and Zag as a Marketing Executive. I also spent four years as a freelance marketing consultant and worked with several start-up brands in the food, vitamins and supplements and specialty health food store categories to help drive growth. Today, I lead the Love Good Fats brand as we have expanded from Canada to the U.S. market and become one of the fastest-growing bar brands in North America. Sweeney: What does the term “good fats” mean? Yorke: For the past 40 years, North American society has been conditioned to think that fat was essentially bad for your health. That is not the case. Carbohydrates and sugar are actually the main culprits of a poor diet. “Good Fats” refers to monounsaturated and polyunsaturated fats that have various health benefits including helping reduce LDL cholesterol, increase brain function, help maintain healthy blood sugar levels and more. Sweeney: What is the mission of Love Good Fats? Yorke: At Love Good Fats, we’re on a mission to spread the word that fat is back, and sugar is out! Our brand aims to encourage North Americans to incorporate healthy fats into their diets. Our ridiculously delicious products are loaded with healthy fats that provide energy, support metabolism and act as super fuel for the brain. Sweeney: What were some key strategies you implemented for Love Good Fats before launching the business? Yorke: The concept for the brand came about in 2016 and officially launched at Whole Foods Canada in September 2017. I spent hundreds of hours researching nutrition and understanding the science of a low-carb, high-fat diet. After educating myself on the process, I understood what nutritional value I wanted my bars to have. The most challenging part about developing a bar recipe was to make sure that it could be made consistently, shelf-stable, and ridiculously delicious. We went through over a hundred of recipes and production methods to get to finally perfecting the formula and the result is what is on shelves today. We also spent a great amount of time researching the potential market for our bars. What drove us was knowing how many people out there were unhealthy and were looking for better choices for their diet. As most people live busy lifestyles, including myself, it can be challenging to find time to prepare healthy meals and snacks at home. I knew that offering the convenience of an “on the go” bar that was healthy and tasted great would be a big hit. Month after month our sales have exceeded our greatest expectations. I thought about the name of the brand, too. When coming up with the name of my brand my goal was to have consumers look at my bars and make the connection of good fats being vital to their health and being able to incorporate them into their everyday diet. The bars were originally named “Suzie’s Good Fats,” as I felt such a personal connection to my brand. However, as we expanded, we felt the name “Love Good Fats” would resonate well with the consumer. Sweeney: Tell me what makes the Love Good Fats snack bars stand out from other health bars. Yorke: Love Good Fats bars have 4-5 grams of net carbs and are gluten-free, soy-free, non-GMO, contain no artificial preservatives, no sugar alcohols, are low in sugar and are also keto-friendly. The bars have a truffle-like core that melts in your mouth and are offered in six delicious flavors. There is a huge white space for convenient high fat, low carb snacks and foods. In general, snacks need to have only 4-5g of net carbs to be considered keto. Three of the biggest pitfalls most bars on the market have are: 1) they contain too much protein or 2) not enough amounts of fat to sustain a keto diet and 3) too much sugar. We’ve hit the sweet spot. Of all the bars on the market in North America today, none of them contain low sugar (1-2g), high fat (14g) and a moderate amount of protein (9-10g). Sweeney: Why did you decide to make the products keto-friendly, specifically? Yorke: Originally, I set out to make a very clean, healthy bar. As I progressed in my research, I felt strongly about creating a product that was high in fat, low-carb and low in sugar. The research on the ketogenic diet is astonishing. I feel like we have just started to see all the ways it has changed people’s lives. Sweeney: Keto diets are a huge trend right now, but do you ever worry that they might phase out over time? Yorke: As consumers are seeking to live healthier lifestyles, I am confident that there will always be a need for Love Good Fats. With the number of health benefits that the ketogenic diet has, the popularity of the diet will only continue to grow as it has improved our lives and health in numerous ways. The changes to our metabolic health so far have been unprecedented in my opinion. Sweeney: What was your first year like in business as an entrepreneur? Yorke: My first year was very tough. Finding someone who could produce the bars was taxing, emotionally and financially. Several plants wouldn’t even attempt to make my bar (they are very difficult to produce) so I was elated when a large, well-known manufacturer took on the challenge. However, after three days on the line, I was informed that they were ceasing production. Having paid for the production out of my own pocket, I was out $80,000 dollars and back to square one. I ended up partnering with an amazing company who was able to make my original bars and help develop additional flavors to the line. I have been really blessed to have so many successes throughout the growth of my business. Our explosive growth in our home market of Canada in such a short amount of time has greatly contributed to our success. Within just 18 months of our launch, we entered the U.S. market in January 2019 at all Whole Foods locations across the nation. This is unheard of for a new, independent brand and we are very grateful for our partnership together. Sweeney: Did you find making the transition across countries to be an easy one, or did it take some time for word of mouth to buzz around Love Good Fats? Yorke: It has been an easy transition thus far due to the popularity of our product. More consumers are educating themselves on living healthier lifestyles and looking for convenient, healthy products to incorporate in their lifestyle. Our products fill that gap. In just under 18 months, we have experienced so much growth across the board and have received lots of interest from U.S. retailers. It’s an exciting time! Sweeney: If you could give yourself a piece of advice before you became a business owner, what would you say? Yorke: I would remind myself to be brave. I am always telling my tribe (that’s what we call our team) to take a chance and be brave. This is one of the company’s core values. Sometimes you will fail, as I originally did with trying to get my bars made, but if you continue to be brave and try, chances are you will succeed. Sweeney: What’s up next for Love Good Fats throughout this year and as it heads into 2020? Yorke: As a rapidly growing brand, we are constantly looking for new ways to bring consumers convenient, keto-friendly snacks. We look forward to having even greater success in the U.S. market.